Fatcat Fiddles just returned from the Wintergrass Music Festival in Bellevue, Washington where we showed all our new instruments at a booth in the Makers room. I got to rub elbows with two extraordinary luthiers from Bend, Oregon, Jason Bowerman and Andrew Mowry ……. Beautiful instruments!! I also got to meet the fine gentlemen from Bent Twig Guitars from Libby, Montana. Their innovation was very inspiring. The whole room was filled with some of the finest instruments, bows, and talented people that you will ever meet. I didn”t get to see a lot of the shows because I had to work my booth, but I made it a point to see Della Mae on Thursday night. I am so glad I did because they were absolutely awesome! I also peeked in on a few numbers from the Peter Rowan Band. I have been a Peter Rowan fan since the Seatrain days back in the early Seventies. Also in that band was the great fiddler Richard Greene. The people I met were amazing. They ranged in age from very young to very old, and you could never tell who would be the next person to pick up one of my violins and play them. It was very satisfying for me to hear all these talented people playing beautiful music on my instruments. I had so much fun, I might have to make it an annual event. Padouk EXP 5 string with Redwood top and maple purfling. Also sports a Zeta pick up and built in pre amp for amplification. These are three original Frank Ashley violins owned by James Garber. It was on his website that I discovered this unique violin. http://paperclipdesign.com/ashley/ Jim has been collecting and playing Ashley violins since the early 80's and seems to be the most knowledgeable person I have found on the F. M. Ashley violin. Frequently termed the 'American Violins'. Used largely in American schools.. This was written in the Universal Dictionary of Violin and Bow Makers by William Henley. 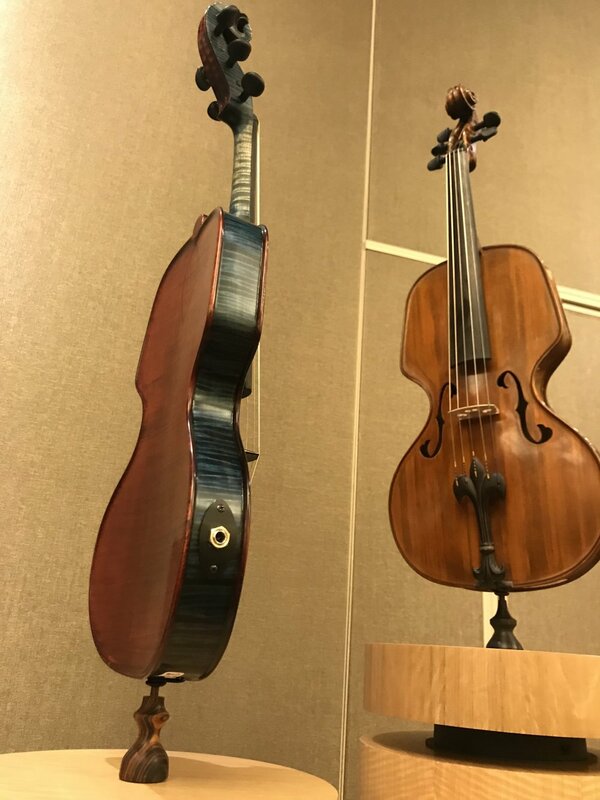 It seems like there should be more of these violins around if they were used in the American school systems, but exhaustive searching on the web, does not reveal too many examples of this violin. The latest project at Fat Cat Fiddles is a 5 string violin that is based off of a Patent that was issued to Frank Merwin Ashley in 1921. Ashley's unique body shape and construction methods intrigued me in my quest for the perfect 5 string acoustic violin. The Patent calls for the top and back plates to be formed from a thin piece of wood rather than being carved from a thick wedge of wood like more conventional methods. There were some reasons cited for why this would be an improvement in violin making, but I am reserving judgement until I have made a few of them. I say a few of them because I have so much time invested in molds, jigs, and fixtures that I feel like I need to make several of them just to justify all the time and expense making this prototype.